She stands in front of her dresser’s mirror. Fixes her hair ever so slightly, checks her makeup one last time. She spins around, checking herself from all angles. She’s ready. Heart pounding, she steps out into the February air, nervous – not sure if she’s making a mistake or on the edge of something wonderful. She’s never seen him before but in that very instant she knows this is him. She’s spent hours staring at his words on her computer screen and she’s even heard his voice but she’s never seen him until this very instant. As if all of time stood still, for the first time she set eyes on the man she was going to marry. Thirteen years ago tonight, I was that girl. My husband was that guy. In January 1999, I threw caution to the wind and placed a personal ad online. This was back in a time when online dating was relatively new and the thought of meeting someone you had met online was not only a new phenomenon but very taboo. Skeptics cautioned me that only axe murders and other unsavory individuals lurked there and I kept reminding them that I found it impossible to comprehend that I could be the ONLY normal person on the internet. It was sheer fate that Adam even found me online. He wasn’t even perusing singles’ ads. Somehow the ad I had placed on American Singles (now Spark.com) had been picked up by the Nova Scotia portal site NSonline.com and just prior to Valentine’s Day, he happened to be visiting that site. A text link to my profile ad came up and curious, he clicked on it. Something made him respond to it. After I replied back to him we began chatting online through ICQ and eventually the phone. (As an aside, many years later we actually met the owner of the site through a twist of fate when ended up living in Yarmouth for nearly a year). We planned to meet in March as he was living in Truro going to NSCC and I had just moved to Dartmouth a few months earlier and was attending CompuCollege. But then one day he asked me if we could move up the blind date we had set ourselves up on to a week sooner than previously planned. I was equal parts excited and anxious. We set the date for Tuesday, February 23rd, 1999, agreeing to meet at Empire Theatres in Bayers Lake. We were to see “Shakespeare in Love” and “Message in a Bottle”. I arrived and waited. And waited. And waited. He was late – very late which I later found out was because he had been lost and wasn’t familiar with the city. I honestly thought I had been stood up. I was the only one standing in the lobby besides the theatre workers. I was this close to leaving. When he finally arrived, looking frantic and relieved all at the same time, I knew it had to be him. It truly was love at first sight. We both later admitted we had that “Well there you are, where have you been all my life cause I’ve been looking for you everywhere ?! ?” kind of feeling. Our comfort with each other was immediate. It was like we had already known each other from a previous life. After the movies we went to a nearby coffee shop and chatted until it closed. When we parted ways he gave me a bag filled with things like flowers, candles, etc. and a card that said he hoped this was the start of something special. (insert “aww!” sound here!) I still have the card and the movie ticket stubs from that night. The next day we asked each other how we thought the date went and we both agreed it was awesome. In fact we decided that we were going to officially date. Less than three months later he moved in with me. That Christmas he wrote me a letter titled “The Most Important Day of My Life“, recounting how life-changing the day we met was for him. I wept reading it. I knew how much his presence in my life was going to alter my future for the better and I was right. I wouldn’t change a step of the journey we’ve taken together so far because I know even when we veered off the path or hit some bumps along the way that they have only solidified our partnership. But the story gets even better! On Christmas Eve 2000, he took me to my favorite beach (Crescent Beach in Lunenburg County, NS) and got down on one knee in the sand and proposed. I of course said yes. On August 10, 2002, we were married on that same beach in front of 180 of our family members and friends. Now here we are, thirteen years later with two amazing sons. I can’t imagine my life without him in it. He’s been my best friend, my husband and my voice of reason. We’ve been through lots of ups and downs together, lived in many places, had many adventures together and I still wake up every morning thankful that he didn’t stand me up that night. Our wedding rings are inscribed very appropriately with “❤ @ 1st Site” which pays homage to our blind date and the fact we met online through the use of the @ and spelling of sight as site. 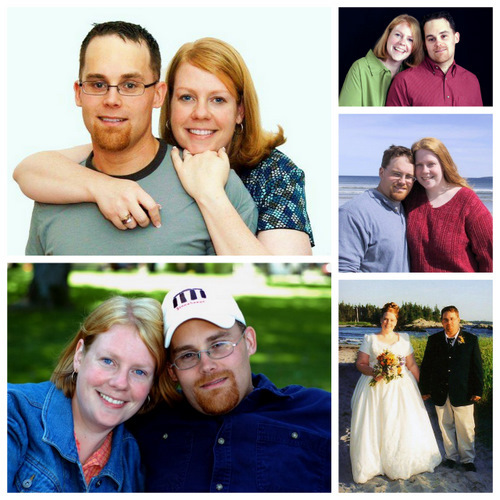 Thank you, Adam, for THIRTEEN amazing years together. I love a good love story. So glad we both founds the loves of our lives thanks to this thing called the interwebs. Enjoy your 13th anniversary – and look forward to the many more to come! Thanks Meegan. It truly is remarkable how the internet has brought people together who would not have otherwise ever crossed paths in daily life. We’re pretty lucky! Awww…what a wonderful story! I love a good love story. So happy for you that you both found “The One”. Thanks Tracey. I consider myself a pretty lucky lady! What an awesome story, I really enjoyed it. Congrats to you Tammi and Adam. I hope there are many awesome memories to come. I am not the sentimental type, and I have goosebumps. He’s such a CUTE axe-murderer. Great love story and so well written! I think you should consider writing as your next venture! Here’s too many more years of adventures in love! Thanks so much Ang. I truly have always felt compelled to write “something, someday”. I hope that in my advanced age, with some experience under my belt that I’ll make that a reality sooner rather than later. So romantic and I love seeing the pics of you together. Do you go to a movie every Feb 23rd to celebrate? Such a beautiful story! I love that you guys have that inscribed on your bands – how perfect. This is the sweetest post. Love it!